When you have programmable speakers set up with multiple different notifications, I think they should display as different alerts. Currently if multiple custom alerts are going off at once, it only shows the icon for the first one to start going off. I would really like to not have custom alerts stack, so I can see each alert that comes in. 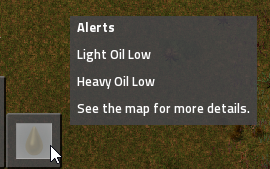 For example, I set up alerts for each of my fluid levels, but when more than one is low, it only shows one of the icons (in screenshot below, Light and Heavy Oil are low, but it only shows light oil, unless I mouse over it). We need that I'm also making lots of alerts and then you only see 1 alert unless you mouseover it.